Can you get hired at a job fair? You can if you follow these tips. I've been to many career fairs, both as a job seeker and as a speaker and advisor. When looking for a job, I would typically come to the fair early in the event, dressed well and holding a binder or folder with resume copies. Once inside, I'd scan the room (or fair map) to decide which companies to visit. Then I'd head first to whichever company stand had the shortest line of waiting job seekers. Instead of aiming to really push my job search forward, I would ultimately just go through the motions of handing out all the resumes I brought with me, trying to get it all over with and get out of there as soon as possible, without truly taking advantage of what was going on around me. 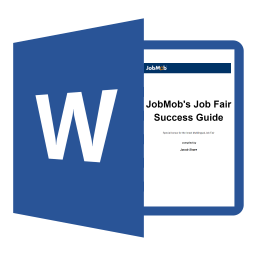 The main reason why job fairs are good for jumpstarting your job search is for meeting company reps, but they can do so much more IF you know how to take advantage of everything they have to offer. 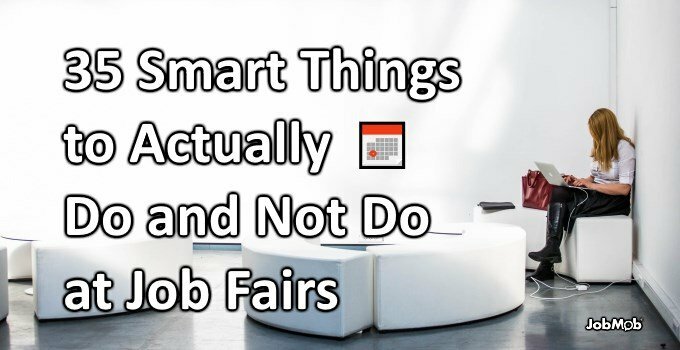 Here's a list of 35 job fair do's and don'ts for success at your next fair. Are job fairs a waste of time? Do fill in an online application form in advance if the career fair organizers requested that you do so. Do dress professionally. For guys, that means ironed shirt and pants, possibly even a jacket and tie. For girls, that's a pressed skirt or pantsuit with sleeves and necklines that are conservative. Don't wear jeans or flashy jewelry. Do have many copies of your resume with you to distribute. Needless to say but I'll say it anyway, make sure the resume is up-to-date. Bring a work portfolio too in case of snap interviews. Don't give out rumpled copies or anything less than crisp CVs, which is why I usually brought a folder or binder. Do come with note-taking gear – a smartphone, or a day planner and pen. If a recruiter offers you a meeting or interview, immediately update your agenda with the date and time in front of that person, which builds your credibility and makes you look professional. Don't try to commit that information to memory and risk forgetting it, which would be very unprofessional. Do have a small backpack or briefcase to hold any business cards, flyers or swag that companies give you. Don't carry about a plastic bag from a local supermarket with your resumes inside. You'd be surprised. Do prepare in advance and have clear goals for the job fair. If you know which companies will be at the fair, research them by visiting their websites and seeing if they have any open positions that interest you. If so, learn about the business and be ready to answer questions when you meet their representatives. Don't make unrealistic goals. Walking out of the fair with a job contract in hand would be one of them. Even interview invites are often unlikely, but it is realistic to get hiring manager contact information that you can act on later. Do make a sales pitch for yourself, also called an elevator pitch: a 30-second infomercial about you. Practice saying it to other people. When you're comfortable enough, you'll get the hang of tweaking it on the fly as you discuss yourself with other career fair attendees. Don't wait until the last minute to do follow these pre-job fair tips but even that is better than not preparing at all. Do arrive early to take some time to develop a plan of action for your time at the fair. Don't bring up the fact that you arrived late if it happens. Do talk to as many people as possible within reason – bearing in mind that quality is more important than quantity – since networking is an important element of any job fair. Don't interrupt other people when they're talking at company booths. Do look directly at recruiters and listen to them. Don't answer your cellphone when talking to any company representatives. Do smile, be friendly and try to relax. Bring a friend if it will help break the ice and make it easier for you to approach the company tables. Don't come to the fair and expect that people will approach you or call out at you like in the shuk (Israeli marketplace, or bazaar). Do take note of whom you submitted resumes to, for following up later. Don't give out your resumes to uninterested companies just for the sake of doing so. You may run out of resumes sooner than you think. Do request business cards. Write down who you met and where on the back of each business card you receive, and in front of the giver. If they have none, ask for their contact information and note it. Don't just stuff the business card in your pocket as if you're doing the giver a favor by taking it from her. Do visit companies that you are unfamiliar with e.g. because you didn't know they'd be at the fair. If their representative asks, give them that reason and say that you normally would have researched them otherwise. Don't pretend that you know their business. They'll notice sooner than you realize. Do ask when is best to contact the company after the fair and write it down. Don't ask and then forget or otherwise miss that contact deadline. Do stop and reflect midway through the fair. Have you accomplished any of your goals? If not, what do you need to change before the fair ends? Otherwise, what's left to be done? Do follow up any job opportunities that you discovered at the fair. Email is good, telephone is better. Don't call during lunch hour or any other inconvenient moment. Do send thank you letters with copies of your CV, especially if you ran out of CVs during the fair. Don't pester these new contacts or be too insisting and appear desperate. Be courteous of the recruiter's time. Do take a look back at your performance. Did you reach all of your goals? What did you do well? Where could you improve for next time? Don't browbeat yourself. Everyone has bad days. What's important is to learn from your mistakes. Behind every success story is a list of failures. It can be easy to have a successful job fair if you take the time to prepare for it and act professionally throughout. 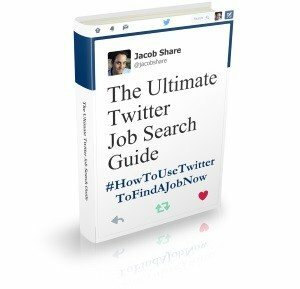 You'll leave a good impression and might even find your dream job. Which job fair tips have worked well for you in the past? What new ones will you need to try next time? Tell us in the comments. 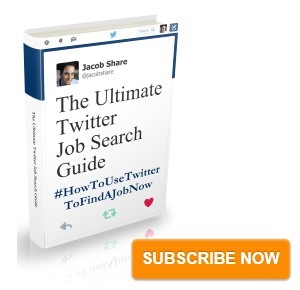 Subscribe to JobMob via RSS or email and follow me on Twitter for more do's and do not do's in your job search. Yes, i agree you do a great job and fantastic service and i really appreciate your help, but i am still yet to find an employment solution…….just a shame these fairs discriminate against over 35s, without a fair explanation. It makes my very irate that these people and companies think you are unemployable once over 35, but im not giving up. Do you know of any english courses here in Israel to retrain over 35s in computers, graphics, web design, etc.? Raymond: thanks for the compliment. I’ll get back to you regarding the courses BUT with the wealth of tutorials on the Internet, is it really necessary? If you already have Photoshop (too $$$) or the Gimp (free! ), perhaps it would be more useful to find a mentor, someone who could suggest an order to go about learning on your own. True, true. Great points. Hope you have a great day at the fair. I had to laugh when you mentioned Photoshoptalent.com. I have already been competing at Photoshoptalent since Febuary, and am currently sitting at 4th position on the leaders board. (out of 2000 artists)Obviously i have already learnt from most of the tutorials to get there….lol…..What i really need is a diploma from an accredited course, which i dont think you can do on line. Most jobs require at least a diploma. I’ve seen your photoshoptalent portfolio and there’s no question you’re talented. Have many companies insisted on a degree? This wouldn’t be surprising but you’re showing applied knowledge, always more important than book knowledge on its own. I’ll ask you again – have you tried freelancing? A degree would have less weight in that situation. i must say with all due respect i find your list of how to dress offensive. “Dress smart” would have been sufficient, without such lines as “For girls, that’s a pressed skirt or pantsuit with sleeves and necklines that are conservative” Why do women have to conform to the ultra orthadox so called dress code? Should they arrive on segregated buses as well? Simon- I always prefer to be as clear and direct as possible. “Dress smart” is a very general expression that not everyone is familiar with, even among native English speakers. Besides, the guideline I gave applies internationally, and I don’t consider it ultra-orthodox-conforming (pantsuit?). Just like with job interviews, it’s always better to play it safe and overdress than underdress. We know that in most Israeli offices, there is no dress code, and many girls (and guys) dress as they wish (tank tops, knee high cargo pants, mini skirts and kilts, etc…), in contrast to overseas where this would not be tolerated. It is still not a good idea to come dressed even in a tshirt and jeans to a job fair or interview.